Had a bit of a search but couldn't find a related ticket so I apologize if this has already been covered. 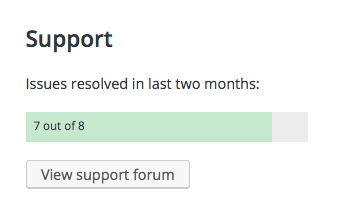 The "Issues Resolved" count is not updating anymore on plugin pages (happening across all our plugins, so not only this plugin). This is making it very cumbersome to see if there are any support tickets waiting. LGRomF.jpg​ (12.1 KB) - added by obenland 14 months ago. Hi @jkohlbach, thanks for the heads up! It looks like the cron job wasn't scheduled correctly. I rescheduled and ran it and support issues should be updated half hourly going forward.